For years, Manhattan restaurateur and real-estate adviser Mark Amadei rented country houses while looking for the perfect place to buy. The challenge: “ I max out at more than a 1½-hour drive,” he explains. When Mr. Amadei, 43, found he could get there in 75 minutes (he drives fast, it should be noted), he was hooked. Even then, it took nearly two years to find Longwood, a 4,700-square-foot, five-bedroom stone house built in 1774. Built on the grounds of the original land grant from King Charles II to William Penn, Longwood’s 14 acres rest amid 200 acres of open space, with the house set back from the road behind big, 100-year-old boxwood topiaries. Mr. Amadei bought the estate for $1.625 million in 2009 with his longtime friend Jonathan Hettinger, a private-equity-fund manager turned real-estate investor. Mr. Amadei led the spending, he says, of nearly $2 million more on renovations, additions, art and furniture. He now tries to spend part of each week there, working remotely, he says. He also rents a home in Manhattan. Mr. Amadei says he wanted to “keep the envelope” of the house clean, but to have fun with furnishings, and to try to bring back what had been lost. He peeled away layers of linoleum to expose centuries-old pine floors and stripped away ’80s-era purple paint and turquoise moldings. The bones of the building were solid. 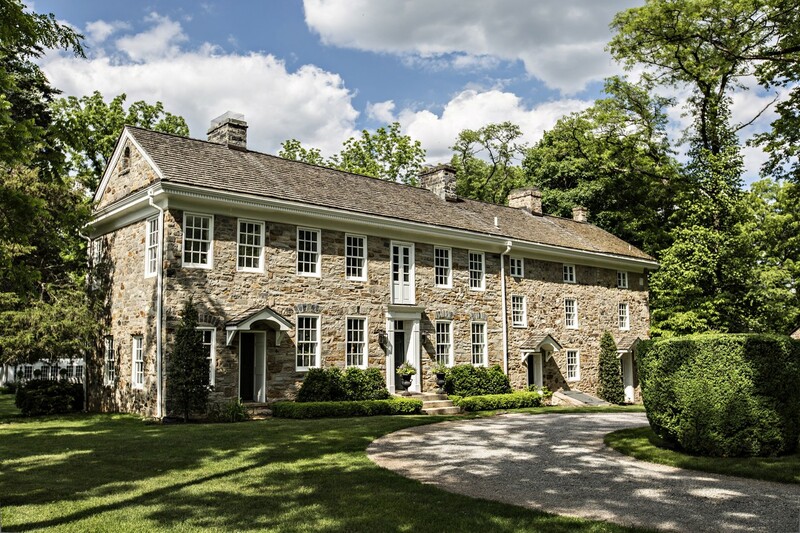 Its original owner, Aaron Paxson, had married a wealthy Philadelphia heiress who added high ceilings and large rooms, an anomaly in stone farmhouses of this type.Mr. Amadei, who is a senior global-property adviser at Sotheby’s and a partner in three restaurant groups, developed an early passion for real estate. Growing up in White Plains, N.Y., he would wake early on Saturdays, comb real-estate ads, make appointments with Realtors and, when his parents woke, give them the day’s itinerary. He began working in real estate at 18. At 21, Mr. Amadei opened his first restaurant in Manhattan, Circa, and today has ownership in Crown Group, which includes the Lion, Bill’s Food & Drink and Crown restaurants; Cafeteria Group, with Cafeteria; and Delicatessen Group, with Delicatessen, Macbar and Empire Diner. As co-designer for Crown with Meg Sharpe, he fills its restaurants with antiques from the Bucks County area. Mr. Amadei and Ms. Sharpe furnished Longwood. In the dining room, the table base is made from 250-year-old oak beams from Longwood’s barn. It is the social center of the house, says Mr. Amadei. Two 19th-century bronze candelabras from France anchor the table, lit by an Edison-bulb installation Mr. Amadei created. Presiding over the room is a 19th-century portrait Mr. Amadei found in a local antiques shop. In the living room, a rough-hewn log bench, playfully titled “Barkalounger,” by artist Edward Zucca, serves as a display table for a chess set made of car parts. The adjacent library also is filled with art, including a 17th-century Italian painting that belonged to Mr. Amadei’s parents, an ornate 1820 cuckoo clock from Germany’s Black Forest and a bronze sculpture by Salvador Dalí. The second floor has a double-tier covered porch added in the late 19th century. Bookshelves swing out to reveal a hidden passageway. A Jean Prouvé metal desk and chair in the sitting room contrast with vintage hand-painted skateboards and bedroom nightstands made from logs on the property felled by Superstorm Sandy. Outside, a topiary garden and a 2,000-square-foot organic vegetable garden and fruit orchard lend texture to the landscape. Mr. Amadei had paths cut through the fields and woods, with several leading to a fire pit encircled with tree-trunk benches. There, he set up a Sioux-style teepee for yoga sessions and added a variety of rugs, kilims and pillows, along with a Maison Jansen campaign bed. Other additions include a pool and pool house. Mr. Amadei had the pool bottom refinished three times to get the color he wanted: that of the sea at Positano, Italy, a “very happy place” for him. Local stonemasons renovated the 12,000-square-foot barn one 500-pound stone at a time.